Administrative authorities in Cameroon say they are tracking armed terrorists who this week killed a Kenyan missionary in the town of Eyumojock in the restive southwest region of the central African state. The slaying happened as many missionaries and foreign workers have been leaving the area following other attacks, and as the government of Cameroon and foreign embassies in that country have urged those workers to leave. 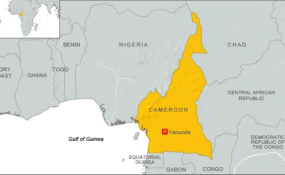 Nigerians living in Cameroon's political capital Yaounde sing in a special ceremony Wednesday to welcome seven fellow citizens who fled fighting in the towns of Kumba and Kumbo in the restive English-speaking northwest and southwest regions. Among them are Okafor Stanley, his wife Okafor Emmaculate Ngoze and their one-year-old baby. Okafor Emmaculate Ngoze says she fled from Kumbo in the northwest after she and her husband were kidnapped by armed men and tortured until they paid a $6,000 ransom last week. "You need to have seen these guys, the way that they are dressed, the way that they are dirty, the way that they are masked," said Ngoze. "The way that they talk. They were seven in number, all of them were having guns. They took us to an unknown destination, I can not tell you where we were taken. In short I can not describe them because it was a very bitter experience." The couple left their hometown Onitsh and settled in Kumbo three years ago. They abandoned everything and trekked over 40 kilometers before a car transported them to Yaounde where the Nigerian community took them in. They are among an unknown number of foreign nationals who have fled the English-speaking regions after attacks, arson, kidnappings and killings. Last Wednesday Cosmas Ondari, a Kenyan missionary, was shot dead in the southwestern village of Kembong, where he worked for the Roman Catholic Church. He was the second Kenyan missionary killed in Cameroon following an April 2017 incident in which a missionary was caught in the crossfire between government troops and militants in the southwest. On October 30, American missionary Charles Trumann Wesco, was shot to death in the town of Bamenda. Earlier this month three Catholic nuns and 13 novices were kidnapped on their way to Kumbo in the northwest region. They were released after 24 hours. Armed gangs kidnapped five foreign road construction engineers last year in the southwest for neglecting instructions to stop building roads. Two were killed in a military a rescue operation. In April, authorities in Cameroon said they freed 18 people, including 12 European tourists, who were seized by separatists in the English-speaking regions. Several embassies now caution workers against travelling to the violence-hit areas. Cameroon's territorial administration minister, Paul Atanga Nji, says although security has been increased, the country still needs the collaboration of every citizen for those who have fled to return when live returns to normal. "It is terrible you can not go to a church and kill," said Nji. "If we all decide not to harbor the terrorists, if we all take one statement that we have to denounce them, because what are they doing? They are doing everything which is evil. Even if you have a family member who is part of that, you just have a choice to tell him either you go out of this thing which is very, very destructive, which is dangerous or you have to meet the justice on your way." The separatists have not claimed responsibility for the attacks on foreigners. The government says those killed are often caught in a crossfire between the militants and government forces. Unrest in Cameroon's northwest and southwest regions began in 2016, when English-speaking teachers and lawyers staged demonstrations criticizing what they called the marginalization of the Anglophone population, which accounts for about one-fifth of the country's 25 million people. The government says over 1,200 civilians, military troops and armed separatists have been killed.